Here we are. The 29/03/19 deadline for the UK is finally upon us. After almost 3 years of negotiations and squabbling in Parliament, the path for the UK’s future relationship with the EU has finally been made laid out. At long last, the travel industry has finally found the certainty that it has longed for ever since the result of the 2016 Referendum. The travel industry can now start to plan for the future and adapt to a new post-Brexit climate. Well, that is what we’d like to say but, of course, we all know that isn’t the case. The reality is that the original 29/03/19 deadline has now been officially pushed back to 12/04/19, allowing time for Parliament to explore a variety of ‘alternative types of Brexit’. Meanwhile, Theresa May clings to the hope of somehow pushing the government’s Withdrawal Agreement through before 12/04/19. It’s All Getting Very Complicated – Indicative Votes? …. but whether any of us actually understand what this means in practice is another story altogether! The ‘type of Brexit’ that we end up with, however, is very important to the travel industry; the outcome will dictate the extent to which UK citizens and companies enjoy the current benefits of the free movement of people, services and goods going forward. We have therefore done our very best to try and simplify the implications of all the many ‘forms of Brexit’ below…. with the cunning use of red, green and orange ticks and crosses! This is one of the key concerns for the travel industry as it affects not only the free movement of tourists, but employees. Green Ticks! Naturally, revoking Article 50 results in a big ‘green tick’ to signify free movement. The EEA/EFTA option also gets a green tick! Unfortunately for those hoping to retain free movement of people, however, the EEA/EFTA proposal was the LEAST favoured option indicated by Parliament, and revoking Article 50 altogether did not fare much better, sitting in 5th place. With slightly more promise, in 4th place on the leaderboard, there is the ‘Common Market 2.0’ proposal (which would be a ‘green tick’, but for the UK having an option to limit free movement for ‘serious economic, societal or environmental difficulties’). Red Crosses! Exactly what would become of the free movement of people under Labour’s Plan, or even under the government’s Withdrawal Agreement, is less clear. Officially, free movement would end. The same is true of the plan to ‘leave without a deal’ and the Customs Union proposal. Leaving without a deal is, however, looking increasingly unlikely in 6th place! The Customs Union option, meanwhile, is looking like a serious contender at 2nd place on the leaderboard – and the single most popular ‘alternative’ to the governments’ Withdrawal Agreement. The promising news, for anyone looking at those nasty red crosses, is the expectation that even in the ‘hardest of Brexits’, the EU will offer a relatively straight forward, and cheap, VISA scheme to the EU providing the UK grant the same for EU citizens in return. Caution is advised here, however, because the opportunity to apply for a VISA does not give anyone a ‘right’ to travel. Compare the situation to UK citizens wanting to travel to the USA and Australia. For some, an e-VISA is granted online immediately. For others, it can be a long and difficult process with no guarantee of a VISA being granted! Another concern for the travel industry is the ability to market and sell services in other EU countries, or even to establish a business or office in another EU country. 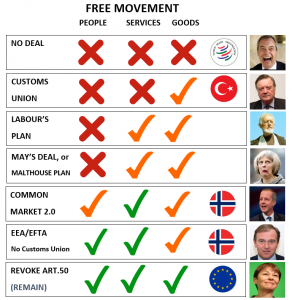 To keep this simple, when considering all the ‘types of Brexit, it looks like we are in virtually the same situation when it comes to ‘free movement of services’ as we are when it comes to ‘free movement of people’. Potentially, there is slightly more promise in respect of services, as shown by a couple of ‘orange ticks’ for both Labour’s Plan and the government’s Withdrawal Agreement. We say that because Jeremy Corbyn talks of ‘access to the single market’ whereas Theresa May is looking to prioritise access for key service sectors such as banking and digital services. Exactly whereabouts the desire to maintain freedom for ‘travel services’ will feature (if at all) on either Jeremy Corbyn or Theresa May’s priority list is, however, a mystery. As far as the travel industry is concerned, this is probably the least important aspect going forward. We say that because travel companies are not typically transporting goods (or equipment) in and out of the EU. There may be exceptions to consider, however, such as a group of cyclists taking expensive road bikes on a package holiday to Majorca. Could tourists be hit with expensive customs duties when bringing ‘goods’ in to the EU without the necessary paperwork? If that is a concern you may wish to read one of our previous articles on this topic here. With the next few weeks looking critical as to how the shape of Brexit will pan out, we aim to be back with another update at the end of this month. For any questions on Brexit and the travel sectors, please contact Matt, Stephen, Farina, Nick or Sophie.